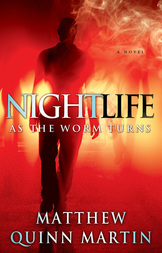 Limited Edition Collection, includes NIGHTLIFE, HAZARDOUS MATERIAL, and the sequel AS THE WORM TURNS. Enter a world where the streets crawl with unimaginable demons, and a monster can lurk behind every friendly face. Matthew Quinn Martin first terrified horror fans with Nightlife, the captivating story of two unlikely monster hunters determined to save the city of New Harbor from the Night Angels—bloodthirsty creatures that feed on the forgotten. Jack Jackson and Beth Becker are among the few who can see these creatures for what they really are, but as they hunt the creatures, a mysterious organization known only as The Division is hunting them. In the novella Hazardous Material, we get a glimpse of The Division’s origins and aims when a young man stumbles onto a long-abandoned video arcade—which three decades ago was the site of the largest mass shooting in New York history—and unwittingly uncovers a relic of unimaginable power and mind-altering terror. And in the never-before-released As the Worm Turns, Jack and Beth are back, along with their faithful dog, Blood. For months they’ve been keeping just one step ahead of The Division, whose enigmatic leader has been pursuing them with the single-minded obsession to capture them by any means necessary. But as Jack and Beth continue their quest to rid the world of the creatures once and for all, they find themselves facing off against something even more terrifying than the Night Angels––something that could hold the key to humanity’s salvation…or its doom. 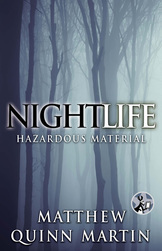 The story of monster hunter Jack and his partner Beth continues in Nightlife: As the Worm Turns…but first, take a short stroll down one of Nightlife's darkest streets in this horror e-novella praised as "A taut, mesmerizing tale of horror, madness and video games...as if Stephen King penned Ready Player One." (TL Costa, critically acclaimed author of Playing Tyler). For centuries an ancient evil has slept beneath the streets of New Harbor. This Halloween, it wakes up. Her quest will take her on an odyssey through the crumbling city of New Harbor, Connecticut. Along the way she meets a homeless prophet warning of something he calls the “Night Angel”—a bloodthirsty creature that feeds on the forgotten. And she will form an unlikely bond with a hunted stranger who knows all too well what stalks the streets at night. The strange man tells Beth the hideous truth about the nightmare creatures that have haunted mankind’s imagination for eons—creatures the world calls vampires. Together they are the only hope for New Harbor, but to defeat what lurks in the shadows they’ll have to conquer something far stronger than fear—their own desires.